The BLElectric light (and a bit more) goes WiFi with a new microcontroller and gets a voice interface courtesy of Mycroft! "Hey Mycroft, Turn on the Lamp"
As you wish! The annoying noise in the background is a 3D printer. It is located about 3 feet from the speaker and demonstrates that Mycroft works well in a noisy environment! Voice and home automation make a natural combination. Yesterday's dream of coming home and telling your home what to do is today's reality. In order to experiment with home automation, I decided to modify an older project of mine, BLElectric Light 101, and make it a voice controlled IoT device with Mycroft/Picroft. I've "recycled" the 3D printed Edison style electric bulb from Chuck Hellyebuck's Filament Friday. A neopixel ring enclosed in the bulb provides the light and color effects. In the original project, I used an Arduino 101 to control the ring using its' on board BLE capability. 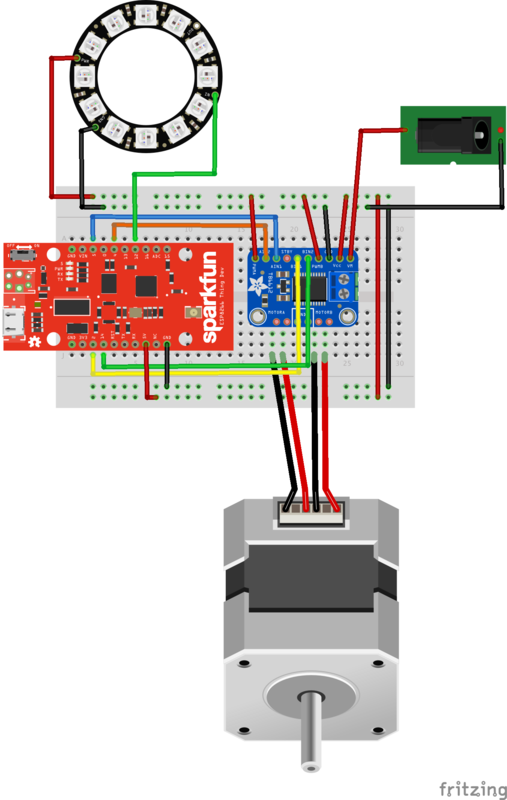 In this project, I've replaced the Arduino 101 & BLE with an ESP8266 based board the SparkFun ESP8266 Thing - Dev Board, and turned it into a web server for the bulb. This allows the bulb, or thing, to be placed on my home Wifi network. Using the python HTTP requests library within my MyCroft skill gives us: Voice IoT! I also decided to hook up a stepper motor to the board. Why? Well because I could! But seriously, from the voice commands I use to actuate it, you can probably guess where I am going with this project in the future. . . Please note that this project could just be done with the Adafruit Feather HUZZAH with ESP8266 WiFi as well. The ESP8266 is a WiFi-enabled microcontroller and it can be programmed through the Arduino IDE. Boards based on this chip from adafruit and Sparkfun are inexpensive and have a large number of libraries, tutorials and code examples to learn from. Their key advantages are the ability to easily program them with the Arduino IDE and WiFi capability. The small size of these boards makes them very easy to imbed into objects and connect easily over WiFi. A relative disadvantage of the board is the small number of GPIO and ADC pins, but as you can see from my project, Huzzah! Color Me With PubNub!, there are ways to overcome this. Overall, the ease of use, massive community support and sharing and WiFi make this a nearly ideal IoT microcontroller for Makers. The up and coming ESP32 boards look to make any concerns about pin numbers a things of the past! Both tutorials cover the installation of the drivers and libraries necessary to use the boards along with the Arduino IDE. After installing the ESP8266 libraries, you should look through the WiFi example sketches. I used these examples to come up with my own web server code, which is described below. A web server is a program that listens on a port for http commands and responds to them by executing code along specified routes( A route is code to handle specific http commands - this will be apparent later). The ESP8266 provides several libraries and numerous code examples to make designing your own web server very easy. Don't be intimidated, your web server sketch will follow the same structure of an Arduino IDE program. It will have a setup() and loop() function, along with some functions, etc. Our web server will have 4 routes. One to handle the root, one to turn the bulb on and off, one to handle light colors and a final one to control our stepper motor. You can think of each of these routes as a function or block of code to execute on demand. In a future refactoring, the bulb related routes will be changed to one route, with 2 parameters, but more on that later. For now I'll go line-by-line on how to set up the code for a web server on your ESP8266 board. If you follow the code, you'll see a list of functions to handle the routes I mentioned above. However, we'll jump into the setup() function of the sketch first. As we are writing our first web server, it's we will need to write messages to the serial port. This will allow us to see the IP address of the board we are using, which will be essential for us to send commands to the board! The stepper handling code is very easy to understand(I apologize for using the delay function) and therefore not very interesting. So I will cover the handleCommand() code which will help you to not only learn how to create and handle a resource path, but also have to have parameters and values sent to your function! The code for handleCommand is defined in the function void handleCommand() and it must have the exact name specified in the parameter to passed to the server.on() function. We create a String variable called message to pass back to the client making the request. You can modify this string along the way to pass any message you wish back to your client. A client could be your web browser, a program you write, or in our case the Mycroft/Picroft system. Two important points here. First if the client should send in a nonsensical cmd parameter value, we will send an error message back to the client. Second, we use a state variable called currentColor to set and keep track of the current lamp color. In the case of turning the lamp on or off, this would be white or black respectively. Using this approach we can reuse setLampColor() for both on/off and specific color setting. The variable currentColor acts not only as the state variable of the bulb, but also is the index into an array of neopixel color objects. If you followed all that, you can design a web server of your own to embed in any 8266 project and make a connected thing! Now that the web server is up and running we can work on developing a client in python. As we saw above, we can use a web browser as our client, perhaps even writing our own custom HTML/Javascrip/CSS page to interact with it. We could also write our own python script to do the same. As long as the computer running it has access to your network you are in business. You can then test much of the functionality you would like to include in your voice skill prior to implementing the skill in Mycroft. If you are comfortable with wring Mycroft skills, you don't have to write a script to test the client functionality outside of the of Mycroft. The bulk of the action in a Mycroft skill occurs in the skill's __init__.py file. You can implement the python code write in this file and debug from there. It's up to you! After looking at these, go ahead and get your own "Hello World" skill up and running! The following is not a comprehensive tutorial on skill design and implementation, just the highlights and some insights. If you can do it with python on your raspberry pi, you can control it with your voice under Mycroft! And it is designed and built for humans to use! We will use this library to communicate with our IoT devices under voice control. The library will allow us to simply replicate the http commands discussed above within our python intent code. Each one of these intents will correspond to one of the routes on our server(except for the root route). It doesn't have to be this way and perhaps this is not the most efficient design, but it works and I'll stick with it for now. If btoharye looks at this, he'll notice some similarity to his home assistant work! The second line is our focus. This regex will allow us to pass the color named by the user under the variable name ColorName on the message bus. The match to this is made by matching the words change or make. I am not using the Action variable at this time. The LOGGER object prints out these statements to the /var/log/mycroft-skills.log. Another way to debug is to have Mycroft speak with the self.speak_dialog() function. Prior to this, I was writing the python skill functionality seperately and them bringing that code into the __init__.py file. However, getting comfortable with debugging "within" Mycroft itself will save you some time and I recommend moving towards this approach. This approach allows us to take the ColorName utterance and use it as a key to access a corresponding color value to send to the ESP8266 Dev Thing. As you can see from this code in the sketch, the color key values and color indexes match. This makes sending the color message easy, especially as we are using the request library! Where ever you see ip_here, replaced this with your boards IP address. Future versions will include this in a settings.json file. In the case where there is no key matching an available color, we report this using the error dialog in the lamp.color.error.dialog file. We can help the user by repeating the requested color, with some valid options(for more on this, see below). Yes, I know the printer is annoying . . . There are so many colors! How do you know which to try and how can we avoid cognitive overload while providing helpful suggestions . . .such are the challenges of voice interfaces. When Mycroft does not recognize the color requested, such as "chartreuse", it replies with a list of 3 alternatives. The three alternatives are a nice way of not only letting the user know some valid options, they also steer the user towards basic color requests. A comprehensive of list of all the color options available would be too much to handle and take up too much time. As I reflect on good voice design I dislike my phrases here: " ..maybe try"? Shouldn't the device know what colors it knows? Lame, I know, I'll get rid of this . . .
Additionally these alternatives are "hard" coded in the .dialog file. A future refactoring would perhaps benefit from proving 3 random colors from those available. Another option, that would give a greater sense of intelligence and responsiveness would be to have Mycroft provide 2 or 3 color options closest in hue to the requested option. Does Mycroft support multiturn/conversational skills? That just allows the user to talk back to Mycroft without having to say "Hey Mycroft". There will be more tools to make building and managing conversations easier in the future, but this is the foundation. Here, where we have an unknown color requested, a multi-turn approach would be ideal from a user experience perspective. You can read about the 3D print and how to put the components together in my write up, BLElectric Light 101. I want to restate here that the Lulzbot mini was able to print the bulb as a single unit without supports. Try it, it works and makes your post-print finishing much, much easier! I recommend replacing the TB6612 with an adafruit DC Motor + Stepper FeatherWing Add-on For All Feather Boards. Hope you enjoy this project . . .more on the way! You can find the complete design files in my prior project. I observed significant heating of the stepper with the TB6612 breakout - replaced with the DC Motor + Stepper FeatherWing Add-on For All Feather Boards - fewer wires, no heating and excellent library!